South Carolina’s great outdoors scene has given way to a multitude of mountain biking locales throughout the state. From state parks near big cities to middle-of-nowhere trailheads, there’s no shortage of places to set off on an epic adventure. Best of all, you’ll have plenty of beautiful scenic views to keep you company. Here’s where you’ll find the best mountain biking trails in South Carolina. A mere $5 grants you entry into one of the state’s most popular mountain biking hotspots. What makes this locale a favorite among bikers isn’t just the variety of trails that cater to both beginners and advanced bikers. There’s an entire community that’s evolved from the amenities and stewardship offered here, such as bike wash stations and water stops for thirsty riders. ASCG offers biking programs, mountain bike instruction courses, and group rides to keep the community thriving. Paris Mountain State Park is a full-service park with plenty to see and do. However, their 15 miles of biking trails stands out as a main attraction for locals and travelers alike. Its prime location near bustling Greenville means plenty of places to refuel and relax once you’re finished pedaling. Admission to park is $5, and bikes aren’t allowed on the trails on Saturdays. Located in Sumter National Forest, this single-track trail system is fully loaded with opportunities for jumping and fast cruising. Each of the four loops span about 5-8 miles each, giving you 37 total miles to roam through nature. If you’re looking to improve your skills, this park features a combination of rock gardens, drops, skinnies, wood bridges, and other obstacles to put your legs (and balance) to the test. They offer several miles of trails that range from very beginner to intermediate, with no shortage of a good time. Mountain biking in South Carolina’s flat coastal regions isn’t exactly thrilling, but Horry County’s Bike Run Park seeks to change that. This short single track has been likened to the mountain biking equivalent of a wooden roller coaster, beginning with a 30-foot hill and giving way to tight twists, small hills, drops and other surprises. Unlike some of the surrounding state parks, admission to Poinsett State Park is free. The folks here take pride in their park, and it shows in their well-maintained mountain biking trails. It’s a peaceful, scenic spot to ride regardless of skill level. Make sure you check out the Knot Loop, which features plenty of climbing drop-offs to challenge your abilities. This 15-mile trail system is a perfect destination for mountain bikers. If you’re skilled enough, head to the northeast section of the trail, where you’ll find tighter curves and an elevated ridge. Obstacles and twists are throughout the trail system, so be watchful. There aren’t any crazy obstacles or tricks to this trail, which is one reason why it’s so popular. Mountain bikers can enjoy a smooth, fast ride while soaking in the sights of the lake and the ridge. 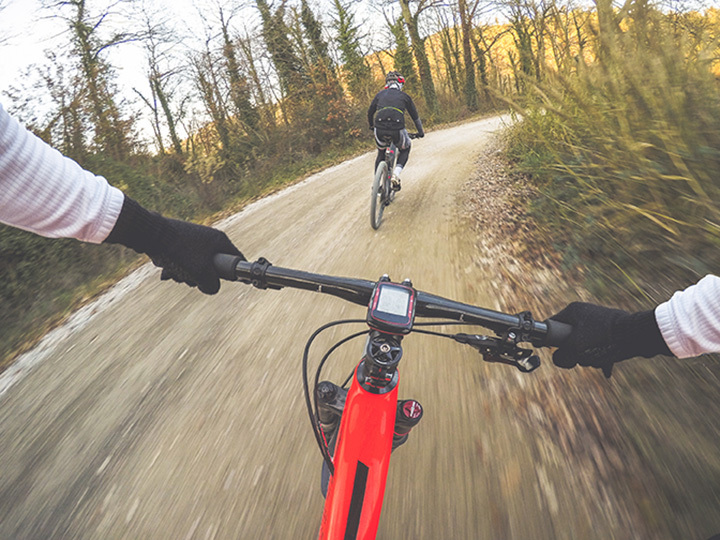 Even advanced mountain bikers will be put to the test on Oconee Connector Trail, one of six mountain bike trails in the park. This fast trail heads straight down Stumphouse Mountain, and once you reach the end it’s a four-mile hike back to civilization. Also in the park are two out-and-back trails and three loops, all of which will make your visit here worthwhile. Mountain bikers of all skill levels can find their footing on the 32 miles of trails here. With creek crossings, bridges, and rolling landscapes, there’s plenty of beautiful scenery to accompany you on your ride. But keep in mind it’s also a horse trail, so be nice to any equine friends you may find.